"Montagi-Varna" Co. is a regular member of the Chamber of constructors in Bulgaria since 1995 and it was listed in the Central professional register of the constructor to the Chamber with a scope for execution of construction projects of all groups. Letter-certificatory No. I - 007761 from CCB - Projects "First group"
Scope for execution of construction projects from First to Fifth categories: high construction projects , its adjacent infrastructure, electronic communication networks and installations. Letter-certificatory No. II - 001609 from CCB - Projects "Second group"
Scope for execution of construction projects from First to Third category: power infrastructure. Letter-certification No. 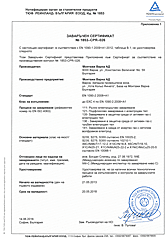 III - 001630 from CCB - Projects "Third group"
Letter-certificaton No.IV - 003769 from CCB - Ptjects "Fourth group"
Scope for execution of construction projects of Second and Third category: urbanizing infrastructure , hydro technical construction and environment protection. The policy of our company is to offer competitive production continuously with high quality which to guarantee the development of company. Our basic purpose is to satisfy at maximum the requirements and expectation of our clients. For achievement of this aim MONTAGI-VARNA Co. has inculcated a system for quality management on the basis of International Standard ISO 9001 : 2015. The Leadership of company is well-disposed with the quality system and with itself managing activity everyday ensures conditions for effective functioning and works actively and purposively for confirmation of system principles into all activities and units of company. The leaders of the units are responsible for supporting and effective functioning of quality system. Introduction to all of personnel with the policy on quality and determination of their responsibilities for its realization. As an Executive Manager of MONTAGI-VARNA Co. I DECLARE my personal participation and responsibility for fulfillment of announced policy on quality ensuring the prosperity of MONTAGI-VARNA Co.